Self-adjusting striker (ﬁg. 3) active both vertically (door uprights) and horizontally (variable distance between door leaf and door frame) (patented system). Ready to open: the deadbolt is released but the door remains closed; you must push to open it. The operation mode is selected by acting directly on the lock. 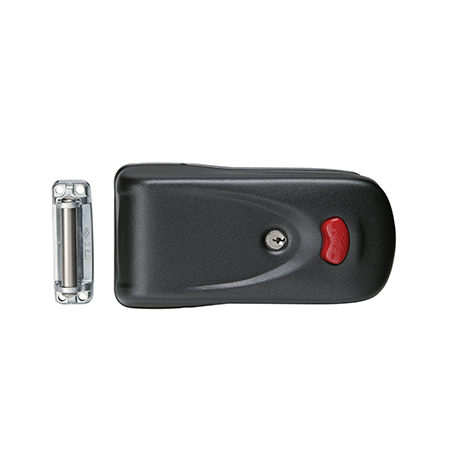 Elettrika is interchangeable with all types of electrically operated locks found on the market (ﬁg. 1). The Elettrika will operate even with undersized power supply, i.e. 250 mA. Will function with different voltages, 12V DC, 24V DC and 24V AC. Prevents damage to the coil when the power button is held down for long periods where the micro-switch cuts power to the coil after a millisecond. It provides a contact that is activated each time the gate is not securely closed, which can be connected to an LED light.